Former phantom post, now ready. WordPress thinks this is only an update, so I have had to repost it afresh. Apologies. Line up of quartet and quintet format, both selections are the five man group. Who was Frank Foster? I confess I didn’t really know much, time to put that right. A tenor player with a hard husky tone, Foster was noted for his contribution to the sound of the so-called New Testament Edition of the Count Basie Band, from 1953 to 1964. During that time his tenor is found on various Donald Byrd albums, Joe Newman, Kenny Burrell and many others. After leaving Basie he dabbled in small group formats, flirting with funky hard bop and soul jazz – song title “Skankarooney” about says it all – leading two sessions for Prestige and one for Blue Note (see Collector’s Corner below). The ’70s found him in a long-term collaboration with Elvin Jones, appearing on a dozen of his titles. As an arranger, performer and educator, Foster enjoyed a long and distinguished career: Artist in Residence at Boston’s New England Conservatory, Grammy awards and nominations for big band arrangements, composed and orchestrated material for various prestigious bands The Carnegie Hall Jazz Ensemble , Lincoln Centre Jazz Orchestra, honorary doctorates, and finally the highest honour in jazz: NEA Jazz Masters Award (2002). A more divergent path is hard to imagine for Elmo Hope. Elmo Hope, an early hard-bop pianist whose promising career was dogged by drug problems. These resulted in the loss of his New York cabaret card and forced migration west, which had the benefit of injecting hard-bop into the west coast jazz scene, while supporting its flourishing hard drug supply industry. I suspect this may be the explanation for his disappearance from the album title “Hope Meets Foster”, retitled Wail, Frank, Wail. Returning to New York, he found favour with Riverside, another artists whose name was inevitably drawn in to his titles: Here’s Hope! High Hope! and Hope-full. Drug and health problems continued to diminish his career, which was cut short by his untimely death in 1967 at the age of 43. An interesting pianist worthy of more attention than he received in his time. Of the trumpet player on this date, Freeman Lee, even less is known. Some sources suggest he had previously played with Duke Ellington, and later abandoned music to become a science teacher, remaining invisible (other than to his students) until his final departure in 1997. Prestige metal, small initials RVG hand-etched, no AB or other marks of provenance that I can see. The quartet tracks have a quite prominent reverb added to Foster’s tenor, reminding me of bootleg recordings of Charlie Parker and Lester Young – someone playing at the distant end of a large room. Maybe that is the effect Rudy wanted, or Frank wanted, but it is a little disconcerting on first hearing. So I have chosen the quintet pieces. Cover art: three wrongs don’t make a right. I don’t think any of these three covers tell you what kind of music is in side, surely the one purpose of cover art? It is not fore-father’s heritage, it is not primitive expressionism, and it’s not a crudely assembled montage of words in a blackmail letter. Art Directors, my office, now. And about that title, fellas. Wail? Vinyl: Esquire 32-033 UK release of Prestige 7021. The liner notes are a strange polemic on bop, swipes at Dave Brubeck, and rehearsing Fosters future assessment of himself: = “I’m a hard bopper” he told an interviewer with the Smithsonian Jazz Oral History Program in 1998. “Once a hard bopper, always a hard bopper”. 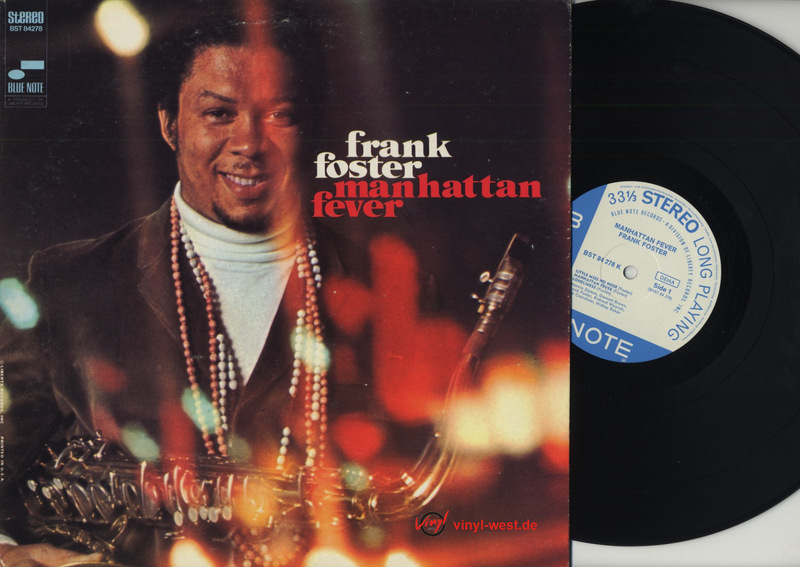 One of Foster’s best albums from the ’60s (according to his 2011 NYT Obituary) was Manhattan Fever released in 1968 on Liberty Blue Note. In one of those strange and sinister coincidences that accompany any one paying attention to life (rather than looking at their phone), this morning in Liguria, Northern Italy, I picked up a copy of Blue Note BST 84278 Manhattan Fever by Frank Foster on a market stall, purchased around six hours before I started writing this part of the post. Doppleganger! Despite the label indicating a German re-issue, like this one above, it bears the VAN GELDER machine stamp in the run-out, indicating authentic US master heritage. This can only happen if we are experiencing unpredictable and intermittent faults in the space-time continuum, over parts of Europe in the 20th and 21st Century. I believe this is the case. Whilst scientists have busied themselves studying thermometers, un-noticed, objects have begun to slip from their proper time and place to create future anomalies. Just for the record, ahem, here is the original Hope Meets Foster cover inverted to its original form. Missionaries, Journalists, Explorers, and Empire. I’m sure it meant something to someone, at the time. Just not now. This entry was posted in Elmo Hope, Esquire, Frank Foster, Prestige and tagged Elmo Hope, Esquire, Frank Foster, Freeman Lee, Hard Bop, Prestige by LondonJazzCollector. Bookmark the permalink. Hi, I read this posting when it came out and have kept my eyes open for a copy. 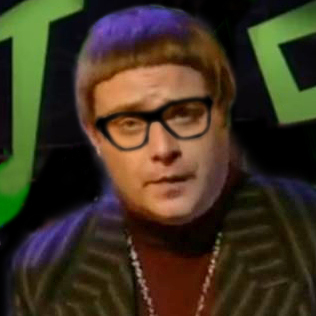 Discogs shows no 1960’s trident pressings. And originals are very scarce! So i broke down yesterday and purchased a near Mint OJC copy that I had seen earlier. I was quirpte surprised to find that it was heavier weight maybe 150 gms. And sounds as good as most RVG stamped Prestige. On Discogs the picture shows the original shrink wrao packaging with stickers stating limited edition Jazz classics and audiophile pressing. The label actual label has a small deep groove close in where a 45 spindle might be. Definitely different quality than other OJC prestige fireworks that I have. Do you any additional information on OJC pressings that might shed some light? I don’t have enough OJC to comment, but people who have comment that the early OJC have a lot of the quality of earlier pressings, the later stuff is just candy-floss. You may well have an early issue there. This happens in a lot of “transitional” times. nice playing with colors: white men become black and black men turn white. Foster plays trumpet, Hope plays drums. I have the Prestige pressing with the painting on the cover and to be honest it’s one of my favorite album covers ever. I think it’s a great album with the swinging ‘Zarou’ being the highlight. Also, the Fearless Frank album has a fantastic track called ‘Raunchy Rita’. I never realized the original album cover was inverted. The picture becomes a lot clearer now. But questions remain as to where and when. More Empire than ante bellum South, as I always thought. But it remains a nice specimen of original cover art. 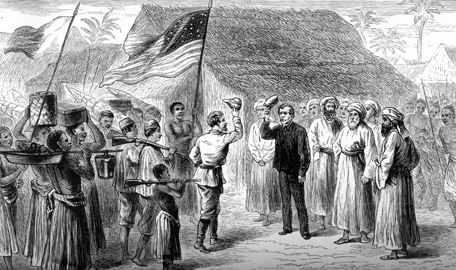 The “Dr Livingstone/ Stanley” meeting was apparently in Tanzania, Africa, near Lake Tanganyika, in 1871. Dr Livingstone was a British explorer and missionary who had gone missing, tracked down by a New York journalist, Morton Stanley. The story of the handshake, as told in Stanley’s newspaper, was intended to symbolise a new relationship between America and the colonial British Empire, as in “the Brit got lost and it took one of our guys to go find him”. It also hints the Brits were lousy explorers, always getting lost. Seems fair enough, but what this has to do with Foster and Hope has me struggling. it is the story of two blokes meeting, somewhere, in the heart of Africa, or in RvG’s studio, is there a difference? They met, point à la ligne. I must concede that sometimes the humour, or word play, in US cover art/design, totally escapes me. It happened to me, that after décades, I found out that pun was intended on a particular cover. But it never occurred to me in the first place that the design was meant to be funny. I was wondering if anyone has compared a RVG Esquire pressing vs the original US RVG Prestige title. Hardly any of the Esquire titles made it over here to the states. I would be curious if Esquire used a higher quality of vinyl, Prestige seemed to try and lower production costs at every turn. 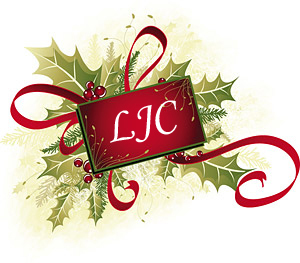 the three versions shown by LJC are of the same high quality. I have all three of them. Prestige only started to cut costs (i.e. use inferior vinyl) from the early sixties on. When I met Frank Foster in ’83,I asked him to sign one of my F.F. 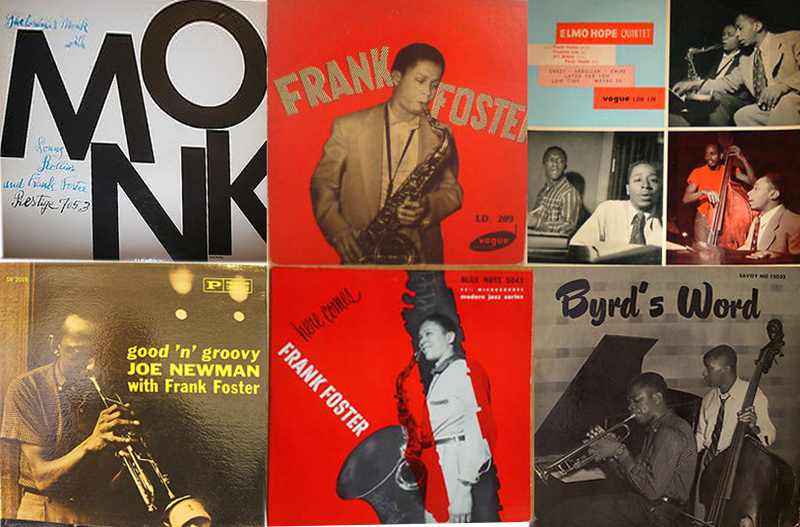 records (Fearless Frank Foster Prestige 7461. )He wrote on the back:”Have some jazz(but not this jazz),it’s good for you!Frank Foster.”Just to warn you that this record is NOT recommended by F.F.! I kept it,just for the signature. Kees, I love your story: it confirms what I felt several years ago, when I sold “Fearless Frank”. One of Basie’s best albums – Easin’ It – has all Frank Foster arrangements. How right you are, sir. I’ve never seen the LP but I do own the Complete Roulette Basie studio recordings (Mosaic). Apart from Easin’ It and – of course – the Atomic sessions, my favourite Basie has always been On My Way & Shoutin’ Again (Verve). Generally however, his Roulette opus seems more consistent to me (and in better sound at that!) than the Verve sessions. thank you for rescuing this excellent session from oblivion. I have always associated this echo-ing sound of Frank’s with this session and considered it to be normal. Thank you for pointing out that it is not. A.T.’s drumming is captured marvelously by good old van Gelder. The Esquire cover “design” is a flagrant example of minimalism, which only Esquire could imagine to be acceptable and marketable. The red, abstract Reid Miles cover done for Prestige’s second issue, is not much better and has no relation to the music either. Prestige’s first cover, a painting courtesy Carole Reiff Galletly, is an excellent companion to the first album title “Hope meets Foster”. The scene is obviously ante bellum. Very enjoyable selections. Foster had a wonderful tone, and I always thought Rudy was best at capturing horns. It seems to my ears that even on the quintet cut Shutout there’s an echo or excess of reverb on the tenor. 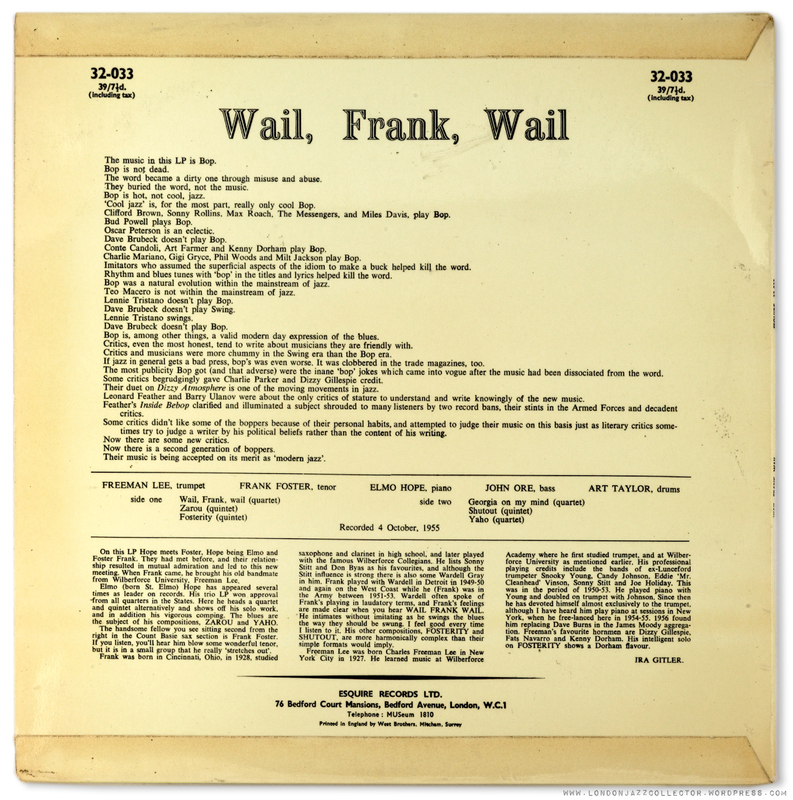 Looking back, I now see Frank on the credits of the mid-50’s Basie recordings for Clef. And he was active in Europe in the 70’s apearing on Steeplechase with Horace Parlan. Elmo Hope had such an enjoyably unique style – it’s sad how he left us at such a young age. I found Frank had the same tone on a similar Elmo Hope quintet recording, also by RvG, for Blue Note this time (BLP 5044), with Freeman Lee and Blakey. We must conclude that it was Frank’s trademark in that period.